Last year when I was looking for a place for my wife and I to celebrate our second anniversary, I was reminded of how generally unenthused I am by the upper ends of Ottawa’s dining scene. “Modern” menus with the same five proteins, the same Edison bulb lighting, the same rooms with neutral colours and some repurposed wood. I’ve got a serious case of jaded foodie going on. However, one jewel of the Middle East distinguished itself from the rest and really piqued my interest – and that restaurant is of course, Shawarma Prince. Seeing the renovations being done to the place before it opened got me looking into it – and I liked what I saw when their website was running and had their menu posted. 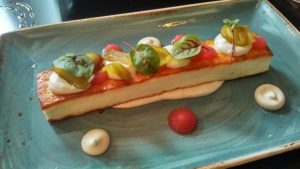 Once it had been open for a year and change – and snagged the title of Ottawa’s top-rated restaurant (Canada’s 100 Best Restaurants, 2017) – it was time to indulge in style. Located in Somerset Village, the mini-neighbourhood with big aspirations, Fairouz is in good company with Union 613 and Prohibition Pub occupying the same block. The renovated brick home has a stylish feel to it with a few bold features like its teal-painted walls, and beautifully stenciled wall art along the curving staircase to the second floor. The symmetry of a screen that divides the front and back ends of the main floor is matched in similarly-styled wallpaper. It’s an inviting atmosphere with lots to look at, but without being overwhelming or tacky. Seating is a mix of tables, bars and leather banquettes (teal, naturally), and my wife and I took our reservation at a table near the bay window looking onto Somerset. 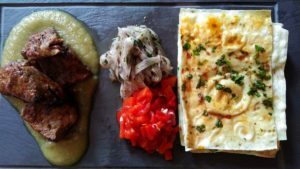 A restaurant’s service is often an afterthought in my reviews because noteworthy service is exceptionally rare – but our server at Fairouz was a true professional. He was incredibly knowledgeable of both the food and drink menus; service was affable, and attentive without being intrusive (I noticed him switch to check on another table when my wife and I were mid-conversation). I hope a good chunk of our sizeable bill there went toward proper wages and benefits for these top-tier professionals. 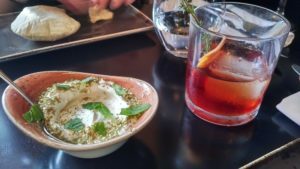 While sipping my Negroni Week special, our labneh arrived. A strained yogurt (just like the now-hip Greek yogurt) the labneh was topped with za’atar and shredded mint leaves, and came with freshly baked pitas. I’m talking still-inflated-from-their-baking fresh. It was a stark contrast to what I was used to from the grocery store or your run-of-the-mill wrap/shawarma/donair, and I would have eaten a pile of them on their own. However, there was delicious labneh to enjoy. Thick and creamy, the preserved lemon gave it a flavour that made me think of my grandmother’s lemon meringue pies. Well, if her lemon pie had herby za’atar on it too, but that’s fairly uncommon in rural PEI. The halloumi was next on the docket. With thin, perfectly golden-brown layers on the top and bottom from being seared, the long slice of cheese looked like a creme brulee. The seasonal accompaniments included slices of green plum and Hershey Kiss-esque dollops of rhubarb and cashew sauces. The sweet and lightly tangy plums played well against the salty cheese that squeaked with each bite, while the cashew sauce complimented the complexity of the browned bits of cheese. Third in line, the kashbushi kebab plate was comprised of cubes of beef with a smoked eggplant sauce, sumac pickled onions, roasted red pepper and an ultra-thin bread called lavash, which had a dose of the beef’s drippings. Given the aforementioned items and adjectives, you can rightly assume that this was a heavenly app. 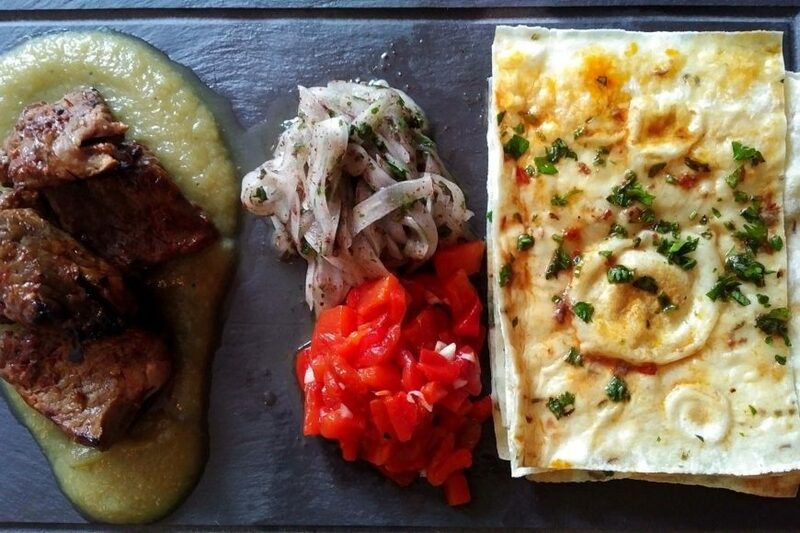 Each scoop of food in the lavash was an explosion of flavour; from the brightness of the onions, to the taste of the grill from the peppers and beef, all topped off with the wonderful smoke on the eggplant puree. If this appetizer didn’t cost as much or more than most of my solo meals out, I would be here weekly just for this. Our two fowl entrees arrived together. The chicken was a hefty size, with a drumstick and several thick medallions of breast meat, seasoned with a bright hit of sumac, and in a rich puree of 24-hour sous vide onion and tamarind. A grilled cucumber salad gave some depth to the fresh veggies, with just a hint of the grill, while the kvass-braised turnip was probably the only ingredient in all the dishes that I didn’t like, as I found it to be too sharp compared to the rest of the plate. 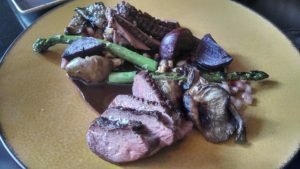 The duck breast was a perfect medium rare, with grilled asparagus, beets, and tender oyster mushrooms. The demi it was in was rich and thick, coating anything that was dipped in it, while the walnuts and pomegranate seeds gave their own pops of flavour. Miraculously, we didn’t need to be rolled out of the restaurant after all this delicious food. 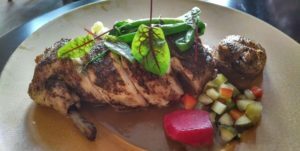 Fairouz is hitting all the right notes – service, atmosphere, location, and of course the food itself with contemporized Middle Eastern fare that’s perfectly executed, and has brought a much-needed shot of life into the city’s food scene.